Behind every continent, there are a few good monsters. There's something primal about monsters, about those things that seem to lurk in the darkness, just out of sight. Horror was largely founded on them, using monsters not only as a threat from outside, something so wholly foreign and inconceivable as to make humanity seem insignificant, but also to embody those very human failings that we try to deny in ourselves. Monsters great and small have filled the imaginations of people stretching back before recorded history, survived as stories, as bad feelings, as warnings about where to go and where to stay away from. Which is why the Monsters series of anthologies from Fox Spirit is such an interesting project, because it solicits stories from writers about those monsters native to where they live and write. This first collection centers on Europe and features a slew of European writers delivering dark stories to frighten and captivate. What I liked about the collection was how varied the stories truly were, reflecting a nice diversity of monsters, styles, and themes. Many of the stories, like Aliya Whiteley's "A Very Modern Monster" and Krista Walsh's "Moments" showcase monsters of a more mindless sort, a kind of big cat and lake monster respectively. These are beasts, mostly, but in each story there are monsters deeper still, human ones who see the world as needing something to hold it in check or emotional doubts and fears that lurk beneath the surface of consciousness. In each there is not exactly any doubt that the creatures are real, but there is a question of whether the monsters are the most monstrous things out there. Is the more dangerous animal the cat or the man who raised it. Is the larger hurt the loss of a loved one or the dread that maybe the love was one sided, that maybe it had been about to end anyway? The stories do an excellent job of marrying the physical monsters with deeper themes and teasing them out slowly even as the stories are visceral and inky dark. Some of the stories take a more historical tract when dealing with monsters, confronting them in times when they were more common. Unfortunately, some of these felt a bit more confusing to me, though perhaps it had more to do with not being as familiar with the creatures those stories chose to use. And of course, there were exceptions to this rule, as I felt that "The Cursed One" by Icy Sedgwick was a historical fantasy/horror done right, about a group of initiates to a secret society hunting a creature with strange and dangerous powers, and how the monster the men are sent to hunt shows a mirror back at them, at the organization they wish to become full member of. It's an interesting tale that managed to use the time period to evoke a historical legacy that made the ending that much more effective. The collection also has the benefit of its format, that of a coffee table book. Along with the stories are some interesting pictures depicting the various beasts as well as a pair of graphic stories that fit in fairly well with the overall theme. The first, "Serpent Dawn," by Adrian Tchaikovsky & Eugene Smith, is great fun, a tale of two women who take care of mysterious cases involving the supernatural and who are drawn into a bungled plot involving a basilisk. It's a well balanced story with art that fits the mood and strangeness of the story, giving plenty of personality to the characters, and this felt like something I'd like to read more of (I suppose I should find out if there is more out there...) as it feels like just the tip of a larger story. The second graphic story felt a bit weaker to me, relying a bit too much on a twist at the end to drive home its point, and with art that seemed almost too pretty for the plot. But it did again revisit the idea of where monstrosity lurks, that humans are just as monstrous as the darkest of myths. My favorite stories in the collection, though, were James Bennett's "Broken Bridges" (about a troll living in the world of men) and Aliette le Bodard's "Mélanie" (featuring no monsters at all, really, but rather a moving love story that had me wanting to read so much more). They are very different, but both show the raw humanity of people viewed as monsters, and show that sometimes monstrosity is created from misunderstanding and loneliness. In both, the "monsters" yearn for companionship, for love, and yet find themselves hampered by their natures. They are incredibly different in how they handle their themes (and how they end), but that's part of why I like them so much, because they represent such different ways of approaching the idea of monsters. In the end, the collection is a nice montage of monsters and a nice sampling of styles and conceptions of what monsters are and how they infringe on the human world. 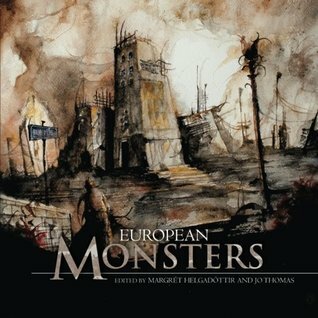 While some are a little less successful in my mind in complicating the standard monster depictions, the collection overall presents a satisfying array of monster stories, from the more traditional to the incredibly innovative. I personally would have loved to have a bit more supplemental information from the authors (probably after each story) about what the monster is (is it historical, what's its significance is), but lacking that I didn't feel lost too often. For me, this is definitely a series of anthologies to watch.